During the 1930s the competition between the London & North Eastern Railway (LNER) and the London Midland & Scottish Railway (LMS) led to services being accelerated. To test the feasibility of these speed increases trials were carried out which were often used to try and break speed records and extract the maximum from the ensuing publicity! 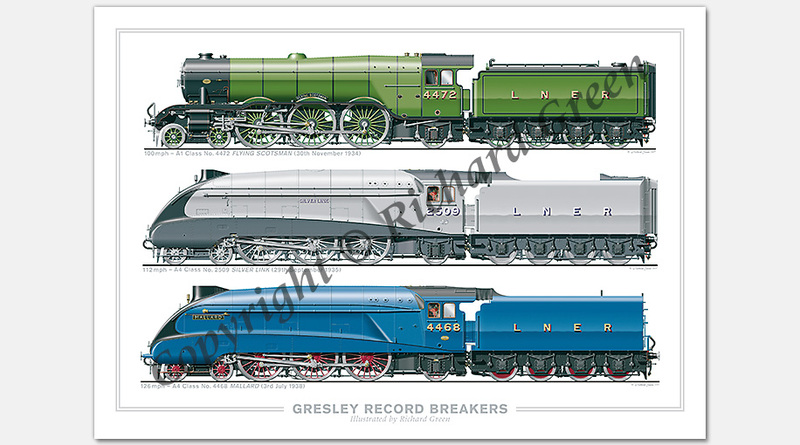 The A1s were designed by H. N. Gresley for the Great Northern Railway with the third, No.1472, appearing after the grouping in 1923. In February 1924 its number was altered to No.4472 and it was named Flying Scotsman. After the class was modified with long travel valves it became possible to run the 393 mile Flying Scotsman service without stopping. To enable the footplate crew to be changed en route a corridor tender was devised. Flying Scotsman was chosen to run a speed test between Kings Cross and Leeds and return, with Kings Cross driver Bill Sparshatt and fireman Bob Webster on the footplate. During the return journey the dynamometer car recorded Flying Scotsman reaching 100mph descending Stoke bank, the first time this speed had been officially recorded in the United Kingdom. Flying Scotsman is shown in the condition it made this run. Built: (Doncaster) February 1923. Rebuilt to A3: January 1947 Withdrawn: January 1963. It has been preserved. 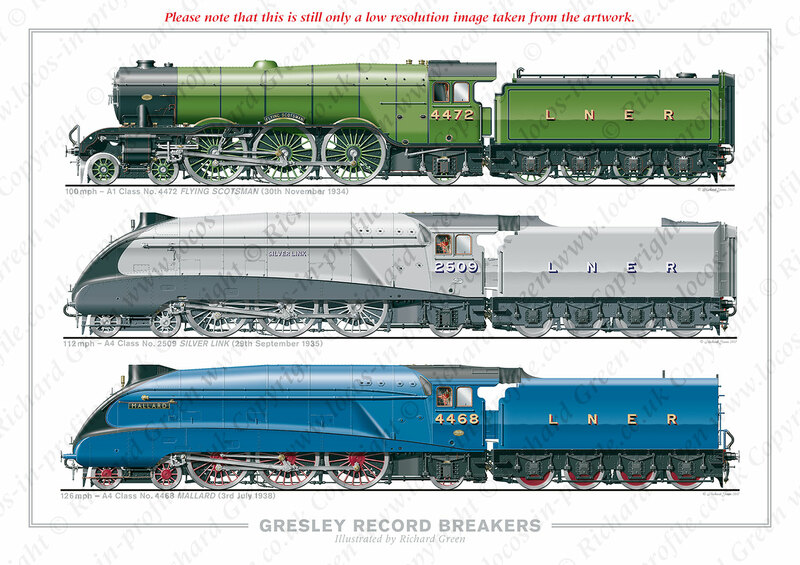 The A4 class was designed by Nigel Gresley to haul the LNER’s new streamlined Silver Jubilee service between London and Newcastle with No. 2509 Silver Link being the first to emerge from Doncaster works. The LNER organised a publicity trip for their new service, run on 27th September 1935, for invited guests and members of the press. It was hauled by Silver Link and crewed by Kings Cross driver Arthur Taylor and fireman Jack Luty. The fully streamlined train of seven coaches averaged 100 mph for 43 miles and continuously sustained over 100 mph for 25 miles, with a peak of 112 mph near Sandy. Silver Link is shown in the condition it made this historic run. Built: (Doncaster) September 1935. Withdrawn: December 1962. No. 4468 Mallard entered service in March 1938 fitted with a Kylchap double exhaust and chimney, to further increase the performance of the A4 class. On 3rd July 1938, during a series of brake tests, an attempt was made to capture the speed record for steam. Mallard was specially chosen for the task along with its usual Doncaster driver Joe Duddington and fireman Tom Bray. On the descent of Stoke bank a maximum of 126mph was achieved near Essendine, which remains the world record for steam traction. Mallard is shown in the condition it made this run. Built: (Doncaster) March 1938. Withdrawn: April 1963.